Ffynnon Cefn Lleithfan is unfortunately a little uninspiring once you find it. Rather than any thought of picturesqueness its main interest is the traditions that are associated with it, showing the lengths to which ancestors were prepared to go to rid themselves of warts. It lies on Mynydd Rhiw with views down towards Bardsey Island and the long curving beach at Porth Neigwl. I say once you find it; it took me three visits. The first time I was way off track and ended up cautiously creeping through a field with “warning bull in field” on the gates. The owner assured me it was quite friendly. Second time I was so close but managed to miss it, so it took a third attempt to track down this unappealing block of concrete. Beneath the rectangle of concrete there appear to be rough stone walls. Apparently when it was open it lay within a walled enclosure with stone steps leading down into the water. 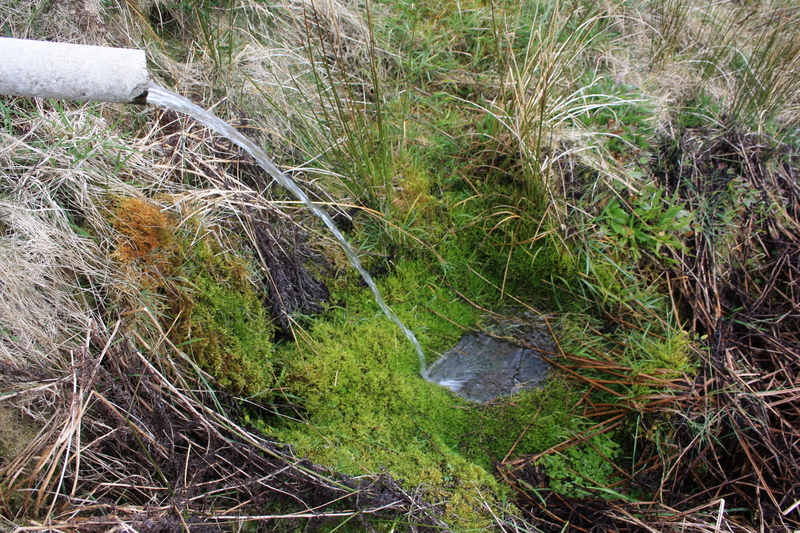 A pipe at the front allows the spring to drain and form a steady stream flowing down the hillside towards the road. 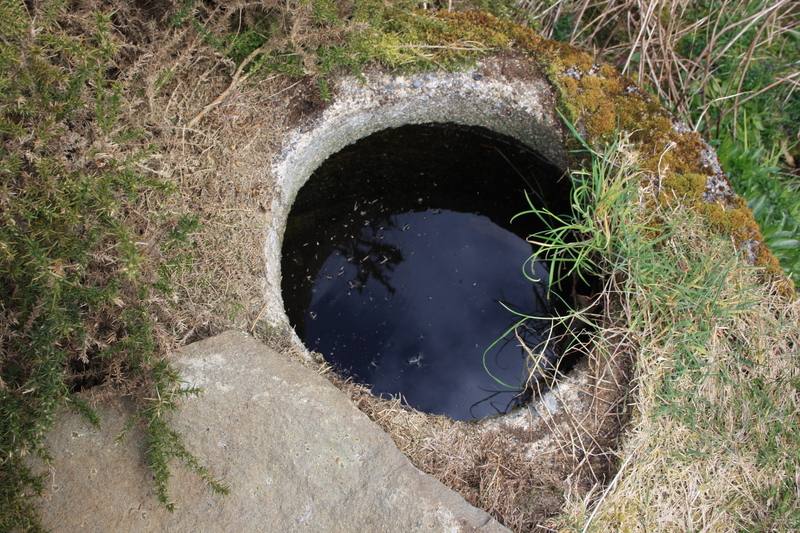 Some 15 yards behind this features lies another spring, which is encased in a cylinder of concrete with a stone cover which can be removed to show that this is full of water (pictured below). Then of course there’s the tradition, and for this story we cite Professor Rhys’s account given him by the local folklorist Myrddin Fardd. .The well’s claim to fame was that it could be used to remove warts. However to ensure success one had to approach the process in complete silence. The wart was to be bathed at the well with a rag or cloth which had grease on it. The cloth was then to be carefully hidden under a stone by the well.. Once done you should leave the well without once turning or looking back. Clearly many loopholes were there, left open, should the cure appear to fail. 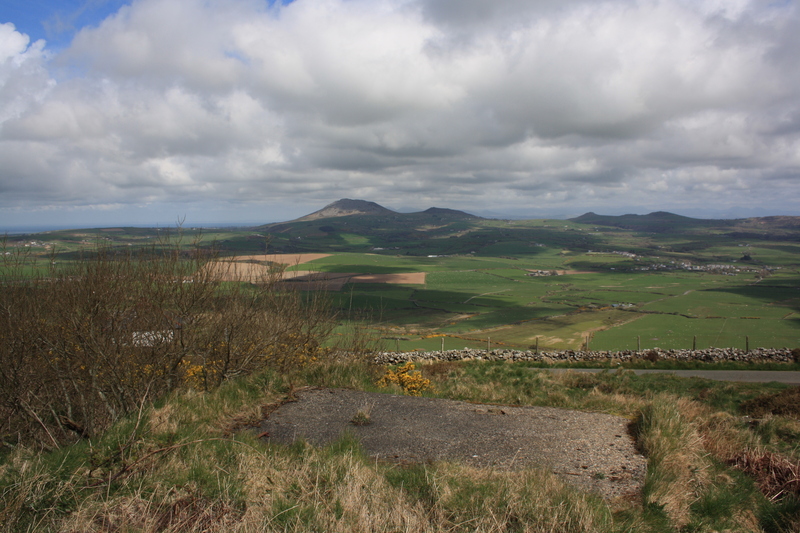 The location of the well Is taken from the research into the wells of Llŷn carried out by Elfed Gruffydd..
Rhys, John (1901) Celtic Folklore, Welsh and Manx. It may not look as picturesque as some wells but there’s something very satisfying about finding a little known and neglected well. What magnificent scenery it’s in, and I love the traditions surrounding it. I agree, it is totally the satisfaction of tracking down these wells that makes it all worthwhile – tracking down both the physical location and the history. Thanks.